Barnston Island is located in the Fraser River just across Parsons Channel from the north side of the Surrey community of Port Kells. From Barnston Island across the Fraser River's Bishops Reach is the community of Pitt Meadows. 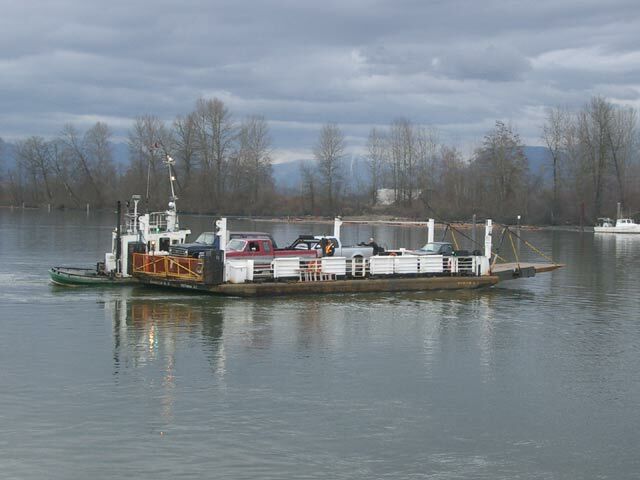 To access the island you have to take a barge-type ferry that is pushed across the Fraser River using a small tugboat. The free-on-demand ferry has limited space for only 5 vehicles and 52 passengers and usually takes only five minutes to cross over to Barnston Island from Port Kells. The Barnston Island ferry terminal is accessed from the Trans-Canada Hwy 1 in Surrey. Travel a short distance north on 176th Street to 104th Avenue. You then cross the C.N. Railway tracks, then go east to the end of 104th Avenue to where the sawmill and the parking lot for the ferry are located. If you do travel to Barnston Island, one thing you should remember there is no public parking allowed along the local roadways. So you either have to walk or cycle along the only road that circles the island which forms around a 9.8 km (6.2 miles) perimeter loop. Barnston Island is home to mostly local dairy farmers some going back to the early 1900's. There are no stores or services present on Barnston Island with the only public area being a section of the Surrey Bend Regional Park situated on the west side at Robert Point. The Katzie First Nations have a small reserve located on the south side of Barnston Island with a view towards Parsons Channel and the C.N. Railway tracks. The Katzie First Nation Band also has a small reserve on the south-east side of the island with traditional fishing grounds in the river. The Robert Point Rest Area section of Surrey Bend Regional Park is only 1.8 km (1.1 mile) from the ferry terminal. The rest area has wheelchair-accessible trails, picnic tables and has pit toilets available. If you do take a dog, please remember that the farmers are very protective of their livestock so dogs are required to be leashed and under control. Also, the river can sometimes be flowing quickly and quite dangerous, so please be careful and watch your children and pets.